SUBHEAD: Federal judge rules Navy training in Pacific violates laws meant to protect marine life. 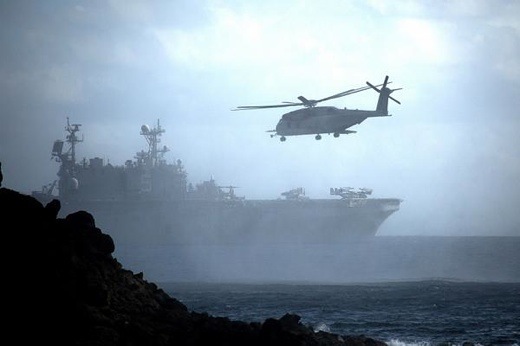 Image above: During RIMPAC 2014 a Super Stallion flies ahead of the USS Peleliu near Hawaiian coast as smoke drifts across the sea near unidentified Hawaiian shore. The Peleiu is a large amphibious warship the resembles a small aircraft carrier that supports vertical and tilt wing aircraft. The 35 year old Peleliu was decommissioned last week. From (http://www.scoopnest.com/s/rimpac%202014/). The Navy has underestimated the threat maritime exercises and the use sonar poses on marine life around Hawaii and California, a federal judge ruled Tuesday. U.S. District Judge Susan Oki Mollway in Hawaii concluded that the National Marine Fisheries Service violated environmental laws when it decided that the Navy’s training would have a “negligible impact” on whales, turtles, dolphins and other mammals. The 66-page ruling said the Navy didn’t explore all possible safeguards to better protect mammals in the ocean, especially given the vast mileage of water that the military used to train. The ruling was praised by environmentalists. The National Environmental Policy Act requires federal agencies to consider a range of alternatives, including ones that could be pursued with less environmental harm, when embarking on operations. Henkin said the Navy has access to 3.5 million square miles of the waters sweeping from California to Hawaii. Some select areas are particularly sensitive for sea life, such as whales. For example, around 50,000 square miles off Hawaiian waters could be classified as sensitive grounds for marine life, and that size can be avoided while leaving plenty of sea for military operations. “The court’s ruling recognizes that, to defend our country, the Navy doesn’t need to train in every square inch of a swath of ocean larger than all 50 United States combined,” Henkin said. The Navy said it would evaluate the ruling before determining its next move and couldn’t comment on specifics. What happens next is still to be determined. Exercises could be moved or stricter permitting regulations could be agreed to. In the meantime, Henkin said he will seek a court order to ensure adequate protections are put in place while it settles out. Held every two years and hosted by the U.S. Pacific Fleet, Rim of the Pacific, or RIMPAC, is the world’s largest international maritime war exercise. In total, 22 nations, 49 surface ships, six submarines, more than 200 aircraft and 25,000 personnel participated in last year’s event from June 26 to Aug. 1. It included live fire target practice, explosives, sonar and the sinking of the decommissioned USS Tuscaloosa 57 nautical miles northwest of Kauai. The Navy says training will kill 155 whales over five years, but environmentalists say the numbers would be much higher. Some Kauai residents expressed concern when the training was here. One of those citizens is Hanalei resident and marine biologist Terry Lilley. He copied U.S. Congresswoman Tulsi Gabbard on dozens of emails and photos over the last year documenting what he says shows the serious damage being caused to Kauai’s nearshore marine environment, including green sea turtles, sharks, reefs and coral, by the Navy’s activities. Gabbard, in turn, wrote a letter in October to Adm. Harry Harris Jr. of the United States Pacific Fleet inquiring about monitoring the effects of military operations on marine life. Sherrouse said the Navy has been training in the Hawaii and Southern California ranges for more than 60 years. 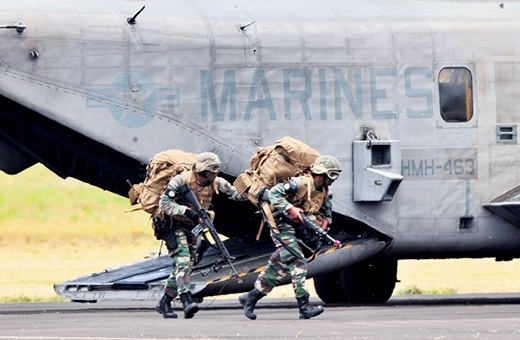 Image above: Multinational Marine forces exit a CH-53 Sikorsky during the air assault portion of RIMPAC 2014 at Pacific Missile Range Facility on Kauai's westside. From original TGI article. But the judge’s ruling stated the Navy doesn’t need all of the waters to still conduct its missions successfully. She also noted the “stunning number of marine mammals” the Navy’s activities threaten with harm. The judge also found the Fisheries Service violated its legal duties to ensure Navy training would not push endangered whales and turtles to extinction.